Esther Bond, housing consultant at Altro, looks at the increasing pressures on social care, housing and healthcare services and discusses how housing associations and councils can help residents live independently at home for longer. The UK’s population is bigger than ever and is getting older too, according to the Office for National Statistics. This brings increased pressure on social care, housing and healthcare services, and makes it more important than ever to help people remain independent and safe in their own homes for longer. According to 2016 figures, 18% of the UK population is over 65, with 1.6 million people over 85 — a figure predicted to double in the next 23 years. People are living longer, and whilst many are staying healthy for longer, there have been big increases in conditions such as dementia, and a range of other age-related conditions too. Alzheimer’s Society reports the number of people with dementia in the UK has reached 850,000, and assuming no public health intervention, predicts that this number will be over two million by 2051. Home adaptations allow individuals who are disabled, ageing or vulnerable to continue to live in their homes for longer. This does require, however, homes to be adapted to provide a safe and comfortable environment for them to live in. When houses are adapted, housing providers must to not only consider the needs of the individual now, but in the future. Physical and mental health can deteriorate over time, and to have a familiar environment that does not have to be changed reduces stress and confusion after the home modification. For the elderly or frail, a simple trip can have catastrophic and life-changing effects, which makes fall prevention measures at home vital. The Age UK ‘Stop Falling’ report states that every minute, six people over the age of 65 suffer a fall. Every year, more than one in three people over 65 suffer a fall that can cause serious injury and even death. The National Institute for Health and Care Excellence (NICE) figures show that falls cost the NHS £2.3bn per year and, according to Age UK, falls and fractures in people aged 65 and over account for over four million hospital bed days each year in England. The starting point when considering how to minimise falls at home is to understand how physical frailty and the dulling of senses associated with the normal ageing process affect how we interact with our environment. For example, changes to a person’s sense of sight include the loss of peripheral vision, colour vision changes, problems with glare and nearer images being blurred. From a practical fall prevention perspective, this can mean that poor lighting or badly chosen flooring can be a real danger. For this reason, Altro would always recommend taking a holistic approach to fall prevention: choose the right flooring products, but consider also lighting, handrails and other safety features. Consider that subtle differences between floors, walls, steps and doorways can cause enough uncertainty to result in a fall, whilst conversely, where different types of flooring are used alongside each other and there is no step between them, it’s equally important to ensure that the materials are as similar as possible to avoid creating the illusion of a step where there is none. Safety flooring should be used for all areas where there is a high, or very high, risk of a slip. This means anywhere where contaminants, such as water, food and shampoo for example, will be present. 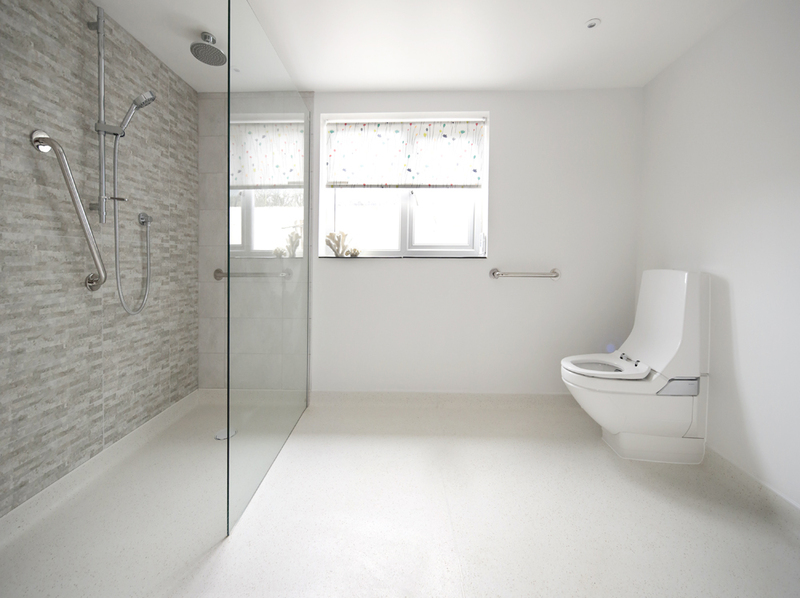 For bathrooms and kitchens, look for safety flooring that guarantees to reduce the chance of a slip or trip to one in a million for the lifetime of the flooring so you can rest assured your home adaption will be safe for years to come. 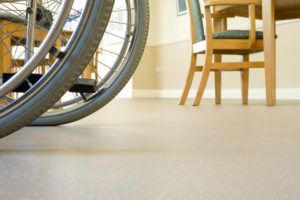 Traditional safety flooring has a ‘sparkle’, which can cause some difficulties to people with visual impairments or dementia as it can appear to be wet. This was a major driver for us at Altro when we developed the first floors without this sparkle some years ago. There are now a wide range of colours and finishes without the sparkle, including bold and bright colours, light colours and wood effect safety floors. These all help to create a homely feel whilst not compromising on safety. Slips and falls are not the only consideration in wet environments. Indoor humidity and poor cleaning can lead to build-ups of bacteria and mould, which can impact health as well as the appearance of the rooms. Tiles and grouting are porous, making them more susceptible to harbouring bacteria. Tiles chip and crack more easily, allowing dirt and bacteria to collect and hide from cleaners. They can also allow water to reach the substrate, causing damage to walls. Grout lines are particularly vulnerable and even epoxy grout is susceptible. Unlike tiles, safety floors have no grout, giving bacteria nowhere to hide. In practical terms, adaptations that are easy to clean and maintain is an important consideration. Quite often carers are in the workforce or are themselves elderly. Having an environment that is easy to keep clean makes life easier — and safer — for everyone. Surfaces that are impervious and can be washed and even steam cleaned allows the highest levels of hygiene to be maintained. 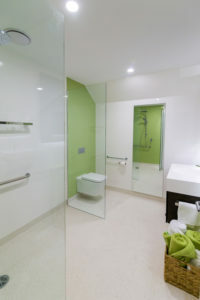 Look for solutions such as a watertight and integrated floor and wall system that is easy to clean and is safe with a number of contaminants such as shampoo, conditioner and shower gel. 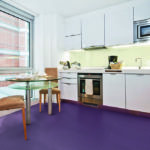 Also look for the latest specialist safety flooring, designed to keep residents safe in wetrooms, bathrooms, toilets, whether they are barefoot or wearing shoes. In people’s homes more than anywhere, a comfortable, welcoming and attractive look matters. There are plenty of safety flooring options with contemporary shades that suit any domestic environment, including latest innovations with a soft-look finish that is more homely than traditional safety flooring.